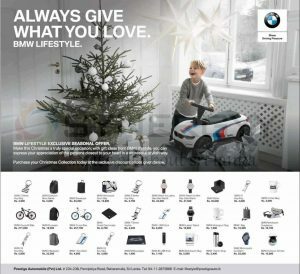 Prestige Automobile authorised dealer for the BMW in Sri Lanka brought you BMW branded gifts (BMW Lifestyle) for your clients, friends and family member and express your appreciation of the persons closest to your heart in a wonderful, stylish way. 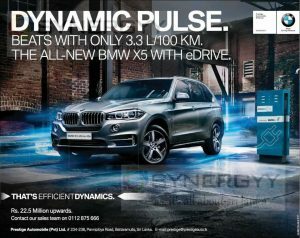 Prestige Automobile introduce all new BMW X5 with eDrive for Rs. 22.50 Million upwards from Prestige Automobile (Pvt) Ltd. BMW X5 with eDrive is known for performance and fuel efficiency of 3.3L for 100 Km. BMW Asia announced Prestige Automobile as the sole authorised importer in Sri Lanka for BMWi – the BMW sub-brand for its electric cars comprising the all-electric BMW i3 and BMW i8 plugin hybrid sportscar. With this appointment, Prestige Automobile will be equipped with specialist technical abilities that will enable them to carry out repairs to the BMW i vehicles’ high voltage batteries. A wider service network is also planned to offer extended coverage for the general service, maintenance and repair of the vehicles. Unlike conventional electric cars that are usually modified from existing on-road models to simply include an electric car battery, BMW i vehicles are purpose-built electric cars drawn from scratch. Designed with a unique Life Drive architecture, the main body (Life Module) of the BMW i cars is made of Carbon Fiber Reinforced Plastic that not only weighs half the weight but is five times tougher than steel. This is the same material that is widely used on Formula One racing cars, fighter jets and selected supercars.